You may have noticed our obsession will all things “Kawaii” recently. Kawaii is the Japanese word for CUTE and basically.. yes means anything CUTE. 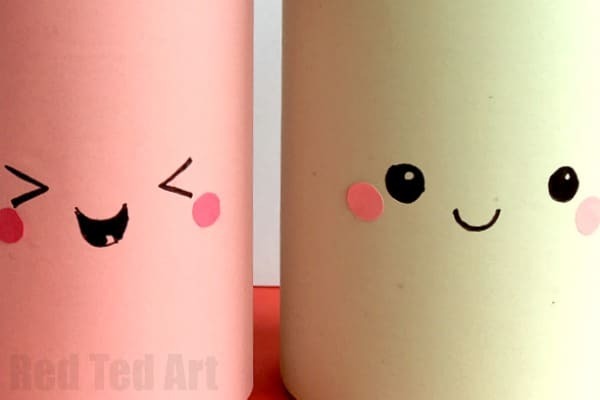 And here at Red Ted Art that means those cute little faces that I like to plaster all over everything on so many of my kids crafts these days (we particularly loving using them on our Corner Bookmarks.. so cute and easy to add and so fun!). So. 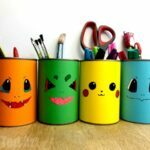 It was only a matter of time for me to apply the “kawaii” theme to Pencil Holders – aka Kawaii Pencil Holder DIY. 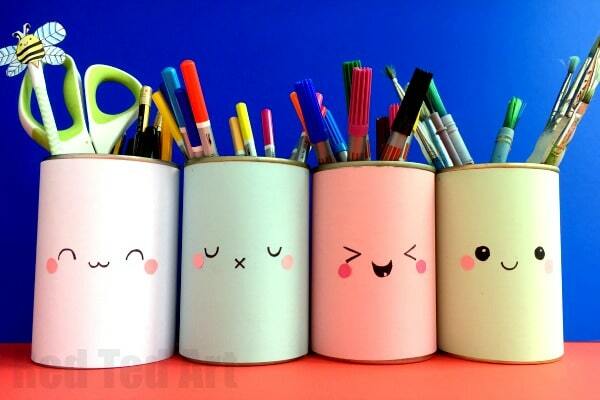 We have made MANY of these tin can pen pots in the past. 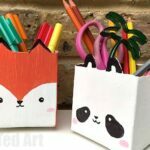 They are so so sooo quick and easy and it was just the most obvious next “cute” desk tidy that I needed to make. 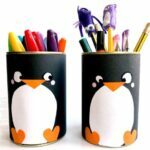 As these pencil holders are sooo cute, I think anyone looking for some Smiggles DIYs would love these too. Add dash of perfume for that Smiggles smell!!! 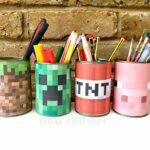 And of course we have plenty more Back To School DIY ideas for you to browse! 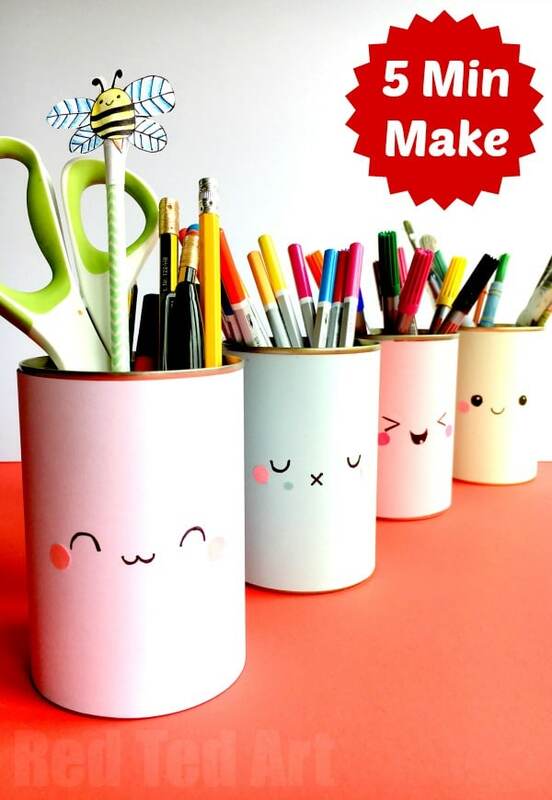 These Pen Pots go perfectly with our DIY Notebooks made from a sheet of paper, you may want to check those out too! You will see in the video, that I made them with one of my fellow blogger (from Simple Parenting) ‘s daughter – Annelise – I invited Annelise to join me at the YouTube Space in London to get crafty with me. MANY moons ago Annelise was the one to suggest that I created more of the Corner Bookmarks.. it is thanks to her that I made the Angry Bird, Minion and Emoji bookmarks… and I thought it was a good way to say thank you! 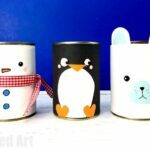 You will see shortly how VERY quick and easy these pen pots really are to make. 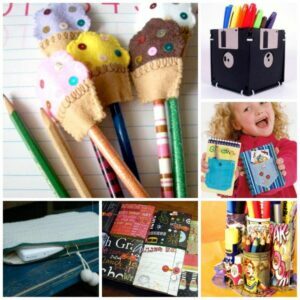 Which is why, we love to update our pen pots regularly – e.g. 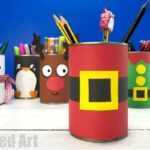 turn it into a cute snowman pencil holder at Christmas, or Minecraft Pen Pots (printables included) later in the year. A great way to decorate and “update” your room regularly. It is cheap, fun, oh so quick and of course just a little bit cute!! I have added written instructions for you below too! 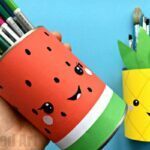 Wrap around your pen pot to measure the length of the paper. Cut off any excess. Take your pens and draw a cute face – do it as central as possible. Practice drawing kawaii faces on a piece of paper first if you need to. We love adding little rosy cheeks to ours! Tape that to the BACK of your tin can. Wrap the paper round smoothly. And that is literally it. Your Kawaii Pencil Holders are finished!! 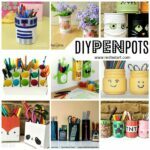 If you enjoyed this little Cute Pen Pot DIY, be sure to head over to our complete list and sample of Pencil Holder DIY Ideas for lots more inspiration! Soo cool, and useful! Glad i found your blog! Love to up/recycle with my kids.